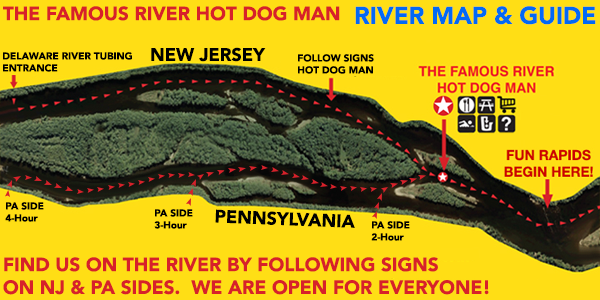 Hot Dog Man: River Kayakers, Canoers, Rafters, and Tubers Rest Stop on the Delaware River! Since 1987! Float into paradise at Adventure Island during your river tubing, rafting, canoeing, and kayaking trip down the Delaware River in scenic river country. Taste delicious, freshly-cooked island BBQ and enjoy a unique lunch experience on a picnic table in the water. Memorable dining, delicious food and a great memory you'll always cherish! THE FAMOUS RIVER HOT DOG MAN: Voted the Truly "Unique Restaurant in NJ"
"SINCE 1987! ": The Famous River Hot Dog Man is the Original River Hot Dog Man that has been serving tubers, rafters, canoers and kayakers on the Delaware River since 1987! This is a MUST SEE stop and winner of the 2008 New Jersey Restaurant Association Award - Voted "Unique Restaurant in New Jersey." ADVENTURE ISLAND: You can enjoy your lunch on our privately-owned, Adventure Island. Rest and relax with hot food on picnic tables in the water! Freshly cooked, delicious and juicy hot dogs and much more are available to all who wish to stop for a tasty snack! VEGETARIAN OPTIONS: If you don't like meat options, we now offer delicious veggie burgers and nachos with cheese. Upgrade options available for Delaware River Tubing customers when redeeming their exclusive and free BBQ meal. HUNTERDON COUNTY, NEW JERSEY - BOARD OF HEALTH APPROVED: All food is brought in daily and you can rest easy knowing that The Famous River Hot Dog Man is Board of Health Approved in Hunterdon County, New Jersey! Stopping at the famous River Hot Dog Man is a must see stop while tubing, rafting, canoeing, or kayaking on the Delaware River! Dont worry about having to pack lunch for your river tubing adventure. We take care of all of the food so you don't have to spend time worrying. Visit our FaceBook and Like Us for an exclusive discount that will entitle you to a $1.00 OFF for any food, beverage, or snack item! Please help us keep the river clean so that future generations can enjoy the Delaware River. It is very delicate and must be preserved for the future. WHAT'S ON THE ADVENTURE ISLAND BBQ MENU? River kayakers, canoers, rafters, tubers, boaters and fishermen are all welcome to stop and visit us while enjoying a fun day on the river. You can smell the mouth-watering BBQ upriver and there's no doubt that you'll want to stop and eat at our unique restaurant. We have more than just hot dogs! Besides our famous and original river hot dogs, we now offer cheeseburgers, chicken sandwiches, veggie burgers and nachos with cheese! Wash it all down with an ice-cold soda, lemonade or bottled water. You can finalize your stomach's desires with an ice-chilled Snickers, Milky Way, Twix or bag of potato chips! You are now MORE THAN ready for river fun! 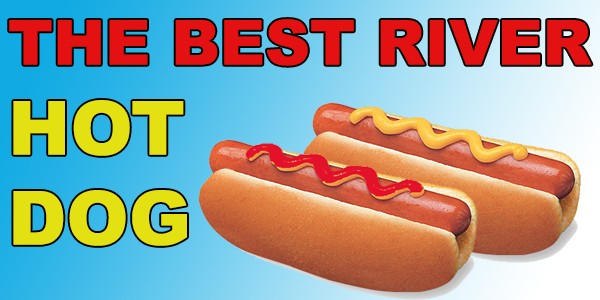 River Hot Dogs - The Original! Chicken Breast Sandwiches - Juicy! Browse our menu, which doesn't include just hot dogs anymore! Delicious chicken, nachos with cheese, vegan and kosher options available! We are literally in the middle of the Delaware River between Point Pleasant, PA and Milford, NJ. Use this river map to find us on the river! "It was super easy to get there, the free BBQ meal at the Famous River Hotdog man hit the spot, and everyone was super nice!" "I went with my aunt, my sister, my daughter and her boyfriend as a group. I have to say we had an amazing time! Loved the hot dogs & cheeseburger stop in the river in the water. We brought our music and will definitely do it again." The Famous River Hot Dog Man, Greg Crance, was a former U.S. Marine that started selling hot dogs to tubers, rafters, canoers, kayakers, boaters and fishermen on the Delaware River in 1987. Now, every rental with Delaware River Tubing gets a free BBQ meal included with all rentals! Stop by Adventure Island while you're out on the Delaware River to visit The Famous River Hot Dog Man, who serves not only hot dogs, but also cheeseburgers, chicken sandwiches, nachos with cheese and veggie burgers!